The tr tags represent the rows and the td tags represent the columns. For example if you need two columns then you would use two sets of td tags between the tr tags. If you need to get fancier with your table like highlighting every other row, making a heading row, changing the size of the table or the cells, then you might want to use a plugin to make the job easier. I’ve been using WP Table Reloaded to make tables like the one on the Coupons & Bonuses page. They just announced that they are merging into a new plugin called TablePress. Both of these plugins have an admin area where you can put the contents in the table cells and customize the look of the table. Then you use a shortcode on your page where you want the table to appear. If you ever want to change the contents or the look of the table, you just make the changes in the admin area and they will automatically display on the page or post with the shortcode. Another cool feature is the ability to import from a program like Excel in case you want to create your contents there first. If you have been using WP Table Reloaded, it is easy to migrate to TablePress. The full migration instructions are found here. Back up your existing tables or in the options section of WPTR select “dump file”. Back up your WordPress database (which you should be doing regularly anyway with a program like Backup Buddy). Click on the Options tab in the TablePress admin area and select to import from WP Table Reloaded. Once your table(s) look like they did before, then deactivate and delete WPTR. Even though TablePress just released its first version, it worked fine for me. Another use of tables is for pricing or feature comparisons. I know you’ve seen those on software sites or subscription sites where the first column is for the basic product, then perhaps there is a premium product next and a platinum product next. Some of these tables are created with images and some with the table code. There are several plugins that will do the job as well such as Mark Dulisse’s Pricing Tables Plugin. This is a shortcode-based plugin with the ability to change colors and even add a corner image to highlight one of the tables. You can have 1 to 4 tables in a row and add whatever content you want within the tables. 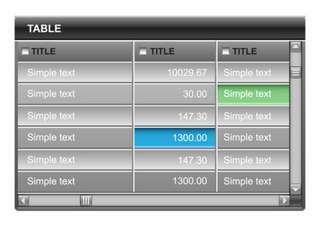 The image below is an example of the tables built with this plugin. Another plugin that has fancy boxes that you can use to build these tables is Instabuilder. If all you need is the capability to build tables, this plugin will be total overkill. It has an full set of page building tools including the ability to build landing pages. You can see how I used this plugin to build my pricing tables for the Affiliate Tools Page plugin. How are you building tables on your WordPress site? Leave a comment to let me know. I had never used tables before but I would probably use a plugin instead of using html. Either way, you gave me some great ideas to use a table on my blog. It’s pretty cool. I think that plugin is very nice to try. I will try those codes and let’s see what will happen. Hi Christine, Thanks for the introduction to the awesome plugins. I liked the pricing tables one. Its clean and neatly designed. Thanks Eddie. I found another one over at Code Canyon called CSS3 Responsive Web Pricing Tables. It really looks nice and is supposed to adjust with the browser size. Thanks for sharing that Christine. I did take a demo of the plugin on my pc, laptop and my smartphone and it looks great and its quite affordable as well.